EaseUS Data Recovery Wizard is a free file recovery program for both Windows and Mac operating systems. It can recover data from internal and external hard drives, as well as USB devices, memory cards, iOS devices, music players, and more. EaseUS Data Recovery has a major disadvantage when you compare it to similar file recovery software but it does have unique features you might like, plus it's really easy to use. 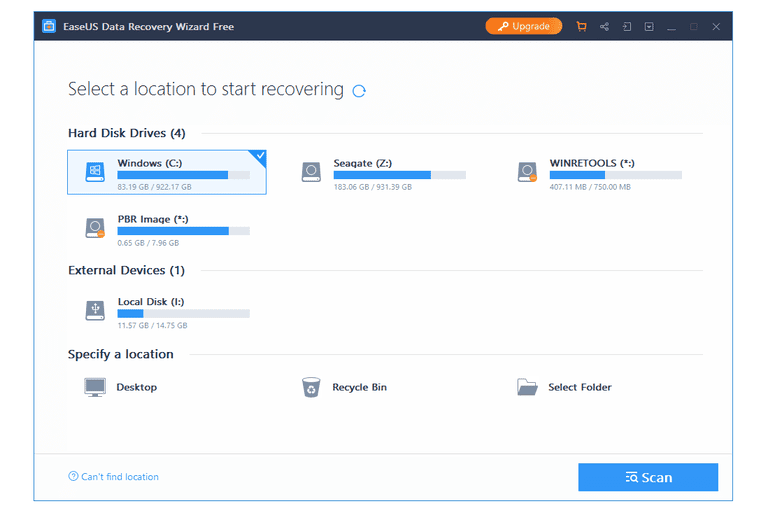 Continue reading for more information about EaseUS Data Recovery Wizard and what I liked about it, or see How to Recover Deleted Files for a complete tutorial on restoring deleted files. EaseUS Data Recovery Wizard is actually very simple to use. The first screen of the program has you place a check next to each category of files that you want to recovery. For example, if you're only looking for video files, you'd choose that option and leave the email, documents, and audio files unchecked. Otherwise, you can scan for all types of files. Then, just choose whether to scan the desktop folder, your personal folders, or an entire disk drive. When restoring multiple files at once, EaseUS Data Recovery Wizard keeps their original folder structure intact. I like that it works this way because it makes it easy to understand where they were before you deleted them. I also like the backup and restore feature, which comes in handy if you've run a scan for deleted files on one drive but want to run another scan on a different drive. You can just back up the results of the first scan to an RSF file, and then restore that same file when you're ready to recover that drive's files. It might seem like a big deal that EaseUS Data Recovery Wizard can only undelete 500 MB of your files, but you'll probably find that the document files, images, or audio files that you accidentally deleted are far less than 500 MB in size. There's an option in the program to recover up to 2 GB for free but you have to first share a social media post on Facebook, Twitter, or Google Plus about EaseUS Data Recovery.